The treatment of varicose veins has become a large market, thus the cases of inappropriate vein treatment have also increased. There are plenty of billboards and other ads that are marketing for the treatment of varicose veins. Not all vein clinics are created equal and several are scam operations, without the patient’s best interest in mind. This is a terrifying reality in today’s world, which can take advantage of individuals, like yourself. The best way to avoid a scams is to be aware, educated, and to ask questions. Any doctor can potentially treat veins, but not all doctors have the appropriate training necessary. Varicose vein training is an extensive program, not just a weekend long training. It requires certification with the American Board of Medical Specialty or the ABMS. Patients should be aware that the term "board certification" explicitly states that those physicians have received formal residency training and have passed a formal examination in a specialty. The only specialties that offer formal procedural training in vascular disease are in surgery (vascular, general or cardiothoracic) and interventional (radiology and cardiology). The American Board of Venous in Lymphatic Medicine (ABVLM) is an examination, not a formal specialty. 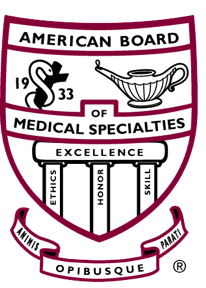 The ABVLM was intended for education purposes only, however, it has been misused by some members claiming they are "board certified" in venous disease. In some cases, patients have been treated inappropriately and harmed by physicians making false claims of board certification. These operations can endanger a patient by performing unsafe procedures, as they are not trained in the proper technique. This can lead to having multiple procedures, scarring the legs, and not having the veins appropriately treated. This can also lead to a lot of money spent, both out of pocket or through insurance. If you are suffering from varicose veins and are considering procedural or surgical options, please ensure that you are either referred or find a Vascular surgeon, as this is the type of physician that should be certified and specifically trained in the treatment of varicose veins. When looking for physicians , it is important to check the physician’s website or perform internet research to look at the physician’s qualifications. Actually seeing a physician is important and if you don’t see one while at a consultation regarding varicose vein, this is a concern that this clinic may not have your best interest in mind. Procedures should be discussed in detail, along with any complications. If there are concerns or you have an unsettling feeling from your initial consultation, getting a second opinion is a good idea. Arm yourself with the knowledge about scam clinics with ways to spot and avoid these clinics to prevent damage to your legs and wallet.